offered by OSU on an unofficial visit yesterday. "Obviously good things with them being in the school in my home state," Young said. "Ohio State, I've always grown up watching them so that's pretty cool." Young, a three-star prospect ranked No. 4 in Ohio for 2017, has offers from the Spartans, Xavier, West Virginia, North Carolina State and others. Things are starting to heat up, and Jackson wants to make a decision before his senior season begins. Ohio State clearly likes him, but Young is also the kind of prospect who maybe the Buckeyes would let slide in the past in favor of chasing someone from out of state. An offer would mean Ohio State is serious about getting more Ohio-centric with its recruiting............."
"He's a good Ohio player waiting for an Ohio State offer. He's AAU teammates with Markell Johnson (another Ohio player high on Ohio State's wishlist) and would be part of a recruiting class that already includes Westerville South center Kaleb Wesson. The Buckeyes could be looking at an All-Ohio recruiting class. But first they'd have to offer Young. "It would be awesome to get an offer from Ohio State," Young said. "It's a great school." COLUMBUS, Ohio -- Ohio State basketball's chances of signing an All-Ohio recruiting class in 2017 became more of a reality on Wednesday. The Buckeyes offered Massillon Jackson forward Kyle Young during an unofficial visit on Wednesday, according to Corey Albertson of TripleDoubleProspects.com. Young is a three-star prospect ranked the No. 3 player in Ohio's Class of 2017. Ohio State already has Westerville South center Kaleb Wesson committed in 2017, and would like to add Young and East Tech guard Markell Johnson to the mix. Young and Johnson play on the same King James Shooting Stars AAU team. Now Young has the offer from the Buckeyes he was seeking. "Obviously good things with them being the school in my home state," Young said of the Buckeyes last month during Session 2 of the Nike Elite Youth Basketball League. "Ohio State, I've always grown up watching them so that's pretty cool." The offer is good, but landing Young is far from a sure thing. while it's probably more of just a "trending, in-state school offers" thing, Young is now 4 of 5 Crystal Balls to OSU, including Jerry Meyer. I mentioned this kid a while back as someone I really liked. Glad to see this offer go out. I wish he was down to 1 school but I guess that is wishful thinking. He has cut his list to 5. Young, who played for King James Shooting Stars on the AAU circuit this summer, trimmed that list down from the top 10 he announced last month. Michigan State, Wisconsin, Florida, North Carolina State and West Virginia got dropped from consideration. 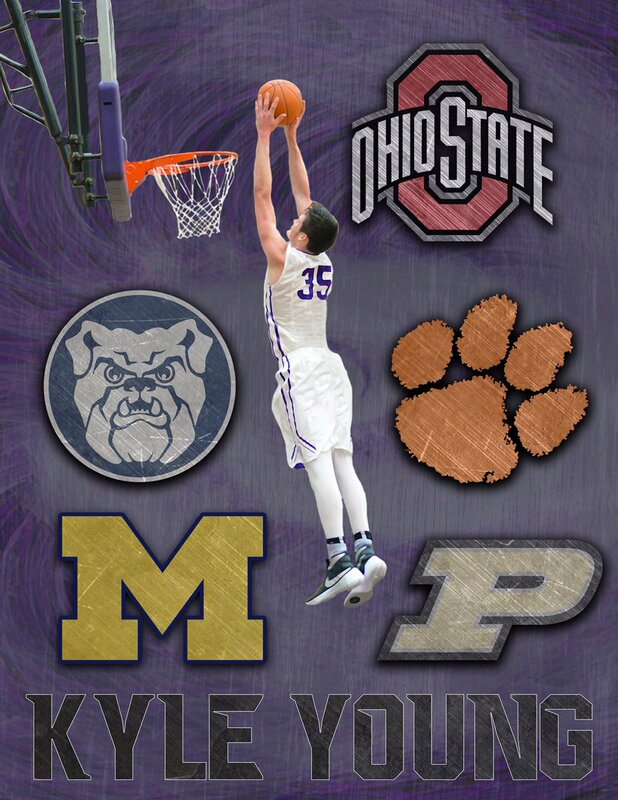 ESPN 100 forward Kyle Young commits to Butler after his official visit this weekend. Big-time pickup. Just based off the timing and the positions they play, I don't think the Bazley and Ahrens commitments helped us here. Young might have still picked Butler, anyways, but I definitely think he would have at least visited OSU first. Just hoping against hope...have liked this kid from the beginning. OSU_Buckguy, LitlBuck and brodybuck21 like this. A source close to the situation told Eleven Warriors it was a "strong bet" Young would go with Holtmann if he were to accept the Ohio State job. brodybuck21, LitlBuck, OSU_Buckguy and 2 others like this.